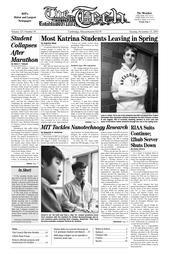 Despite our reputation, there are those at MIT who crave the sports fever and school spirit so commonplace at other colleges. For the “Superfans” who attended the semifinal match of the NCAA Division III New England Regional volleyball tournament where MIT played Colby College, it was a chance to enjoy just that. A small, devoted cadre of 25 MIT fans sat amidst a screaming throng of 450 Colby College undergraduates, family, and alumni. Although Tech fans — including a member of the men’s volleyball team sporting paint on his chest and a volleyball as a hat — held their own, the noise in the gymnasium was enough to unnerve even the fourth-seeded, 29-9 MIT women’s volleyball team. Whether it was the noise or sheer nerves at having made it to the second round, the Engineers got off to an unsteady start. Despite scoring the first point of the match on a serve by Carrie C. Buchanan ’08, MIT was put on the defensive from the beginning. Colby went ahead on a kill by their star, Cait Cleaver and maintained that lead. In addition to a half a dozen bad serves, MIT was plagued by miscommunications. Twice in the first game, two Engineers backed away from an easy ball on the assumption that the other would field it, letting it drop for a Colby point. Despite a few excellent plays by Austin Zimmerman ’06 and Caroline D. Jordan ’06, the Engineers spent most of the first game getting their feet under them. Tech fell quickly to the Mules, 30-22. The second game looked to be a repeat of the first, as the Mules took the lead quickly on Kendall Kirby’s serve. With two aces and two short volleys off her serve, Kirby got Colby off to a 4-0 start early in the game. Missed blocks, net faults, short serves, and long balls increased their lead to a nearly insurmountable eight points at 12-4. At that point, however, the Engineers began to get their rhythm back. Midway through the second game, Colby fans began heckling the server The chants seemed to have the opposite effect, focusing the Engineers as they went to serve. The number of bad serves dropped dramatically. As the Colby crowd bellowed, the Engineers began to plug the leak. Zimmerman’s kill to the back corner, a couple of kills and blocks by Briana J. Stephenson ’07, and an ace by Frances M. Rogoz ’07 allowed the Engineers to maintain the deficit while they kick-started their offense. Dill, seeing the situation for the impending loss that it was, called a time out and attempted to rally the troops. Whatever he said seemed to work, because when the Engineers returned, they were a changed team. Instead of her expected set, Zimmerman jammed one in for a kill. Subsequent kills by Ellen E. Sojka ’08 and Alexandra N. Huston-Carico ’08, along with an ace by Zimmerman continued the charge. When Arlis A. Reynolds ’06 took the serve, she helped the Engineers to within three, taking them on a five point run. Shaken by the sudden loss of their eight point cushion, Colby College took a time out, their first of the match. With the score at 22-19, the Engineers were undaunted and scored four more points in quick succession. A bad set by the Engineers tied the game again, but they quickly regained the lead on a kill by Rogoz. The back and forth continued as the score reached 26-26. A service ace by Jordan, accompanied by a kill by Rogoz and a missed tip by Colby gave game point to MIT, ready to complete the comeback with the score at 27-29. But the Mules scored four straight points, giving the most hotly-contested game of the match to Colby in a devastating turnaround. In the third game, the Engineers hit their stride, as Rogoz and Huston-Carico made kill after kill. Taking the lead from the very beginning of the game, Hunting regained her confidence as she landed her serves and reeled in two aces. Zimmerman grabbed a tip and Jordan made two aces. Sojka and Stephenson were on fire, avoiding the blocks and landing kills like the regular season. Colby’s Cait Cleaver was incredible, keeping Colby in the game even as MIT heated up. Her height and her power made her an great player and the anticipation in the crowd as she went up for a kill was palpable. She was impossible to defend against when set up well. MIT’s lead was threatened as Kirby took the serve for the Mules again, landing two aces before a long serve, bringing the score to 20-22. On a Tech game point, Zimmerman took the serve. A collision in Tech territory raised the specter of the last blown lead, but MIT rallied, and on a Zimmerman set, Sojka came in for the kill, giving MIT their first game of the match, 30-24. In the final game of the match, MIT was still hot, keeping within two points until late in the game, but Cleaver was unstoppable. As the match neared its end, the play took on a frantic pace, as the game plans and careful strategies were replaced by a desperation to stay in the game. With the Engineers down, 29-25, after a blocking battle at the net, Rose Zhong ’08 came up with a kill that kept MIT in the game. As Jordan served with the game on the line, the crowd was on their feet, deafening as they waited for the volley. After a short volley, MIT missed a return, giving game and match to Colby College. MIT came in first in the New England Women’s and Men’s Athletic Conference with a 29-9 record for the season to qualify for this tournament. In the first round they defeated Bridgewater State in a decisive 3-0 victory. In that match, Stephenson pulled in a team high 13 kills, while Zimmerman gave out 41 assists, along with 11 digs. Rogoz came up with 10 kills, and Reynolds held the defense strong with 23 digs. Colby College went on to defeat Tufts University in the third round to win the Regional Title.